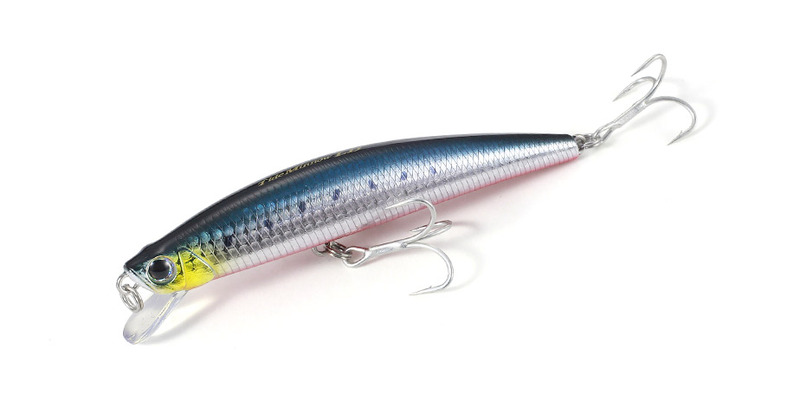 Tide Minnow 120LD has been developed to target blackfin seabass, with a precisely balanced ability to catch the water with the lip. It`s slow sinking, yet high density body allows for great action and response in big swell and whitewash. It can be accurately cast into strong head winds and accurately controlled in the complicated currents where the swell meets the rocks. This is a slow sinking model balanced specifically for whitewash where lures tend to have greater buoyancy. It is also very stable if allowed to “swim” in outgoing currents or big swells. Its high castability make it possible to hit relatively distant targets even in strong headwind. In order to properly swim in rough conditions by the rocks, we focused our attention on the water-catching lip and the weight system. We have given the lure enough diving ability so the lure can be traced underwater all the way to one`s feet. The characteristic also comes handy when casting from high ground. We have used a lead ball as the moving weight and fixed weights at the front and back to ensure a low corner of gravity.